A collection of humorous essays and anecdotes that reviewers have compared to “Erma-Bombeck-meets-David-Sedaris.” Whether as a political observer on the campaign trail in 2004 (avoiding arrest at Coors Amphitheater, but just barely), a young mother and teacher, or grandmother to twin two-year-olds (pictured on the cover), this book will help you to laugh through life, providing many chuckles over familiar and universal life situations, whether lost cell phones or golfing foibles. 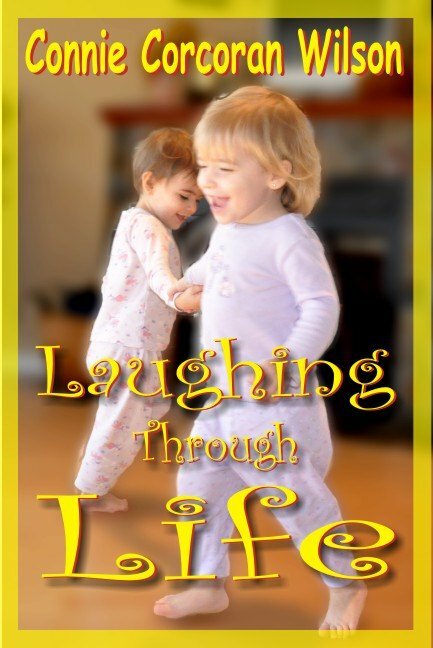 Laughing Through Life by Connie Corcoran Wilson is a collection of humorous essays and anecdotes. The initial essays are all quite funny. Some of the material included in the collection is truly "laugh out loud" funny, while other material, at least for me, is decidedly not as humorous. This is an easy to read collection that requires no great time commitment in order to enjoy the essays. It is organized and arranged to facilitate reading the essays and anecdotes in short bursts. I would hazard a guess that if your politics align more closely with Wilson's then you might enjoy some of the political essays much more than I did. I have a feeling many people will be able to relate to some of Wilson's adventures and observations. I actually had a similar experience as Wilson, when I was getting a second piercing in my ears several years ago, although in my case the audience watching me was my daughter and a whole group of young girls who were there to get their ears pierced for the first time. I'll admit that I found it odd that even though the front cover shows Wilson's twin granddaughters dancing, there is nary a story about them. In general, as a whole, the political essays were less humorous and more biting, thus less enjoyable for me. This also made the collection feel uneven. Perhaps it would have behooved Ms. Wilson to organize the material into two different collections, making one book humorous essays and anecdotes and another observations about politics. Readers can always follow Connie Corcoran Wilson's blog, Weekly Wilson, for more of her writing and reviews. Recommended - actually this would be an easy, enjoyable book to read during this time of the year when people are so busy with other activities. Please come back tomorrow when Connie Corcoran Wilson will have a guest post addressing the importance of laughing your way through a stressful time. Disclosure: I received a copy of this book for review purposes. All this came about when my handy dandy space heater shorted out just as I was about to step into the tub. Since I wasn't exactly dressed in my Smokey the Bear fire-fighting costume at bath-time and had no desire to ruin any good towels by putting out the fire with them, I quickly unplugged the heater, crouched on my hands and knees, and blew the flames out. I'm glad you enjoyed some of it, if not the political parts.